Disaster in Fairyland! Jack Frost has stolen the Music Fairies’ magic instruments to cheat in a human talent competition. But now humans will find out about Fairyland, and all the fairies will be in danger! Sadie’s magic saxophone is being guarded by troublesome goblins. Can Rachel and Kirsty get it back for her? I was so glad that Kirsty and Rachel trick the goblins into giving them Sadie’s saxophone and I am glad that Rachel’s freind’s band won after all. Really Good! Disaster strikes in fairyland! 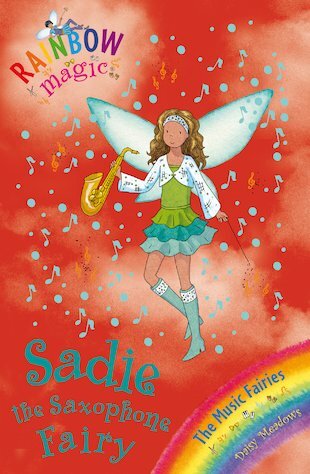 Sadie the saxaphone fairy has to find her saxaphone before the evil jack frost does. But once again Rachel and Kirsty are there to help.